You know that Wi-Fi connectivity provides cost savings and flexibility for your expanding network. D-Link lets you harness the power and speed of 802.11n Wi-Fi for business networking applications with the AirPremier N Dual Band PoE Access Point (DAP-2553). D-Link®, an industry pioneer in wireless networking, introduces a solution for businesses seeking to deploy next generation draft 802.11n LANs. 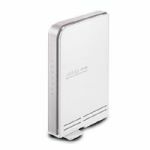 D-Link unveils its new AirPremier N Dual Band PoE Access Point (DAP-2553), designed specifically for business-class environments to provide secure and manageable dual band wireless LAN options for network administrators. The DAP-2553 allows network administrators to deploy a highly manageable and extremely robust dual band wireless network. All three dual band antennas are detachable and can provide optimal wireless coverage in either 2.4GHz (802.11g and draft 2.0 802.11n) or 5GHz (802.11a and draft 2.0 802.11n) bands. For advanced installations, this new high-speed Access Point has integrated 802.3af Power over Ethernet (PoE) support, allowing installation of this device in areas where power outlets are not readily available. The DAP-2553 delivers reliable wireless performance with maximum wireless signal rates of up to 300Mbps* in either the 2.4GHz or 5GHz wireless band. This, coupled with support for Wi-Fi Multimedia™ (WMM) Quality of Service features, makes it an ideal access point for audio, video, and voice applications. Additionally, the DAP-2553 supports load-balancing features to ensure maximum performance by limiting the maximum number of users per Access Point. 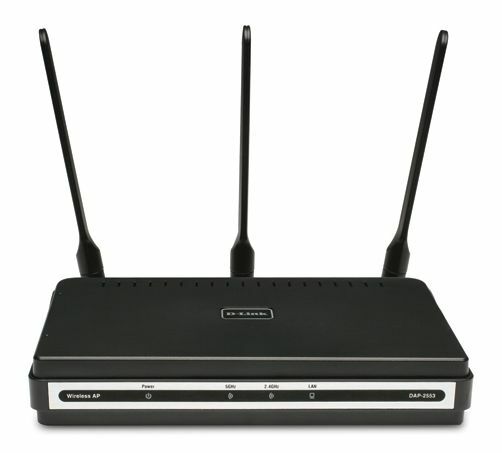 To help maintain a secure wireless network, the DAP-2553 provides the latest in wireless security technologies by supporting both Personal and Enterprise versions of WPA and WPA2 (802.11i) with support for RADIUS server backend. 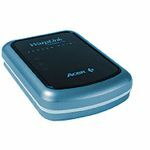 To further protect your wireless network, MAC Address Filtering, Wireless LAN Segmentation, Disable SSID Broadcast, Rogue AP Detection, and Wireless Broadcast Scheduling are also included. The DAP-2553 includes support for up to 4 VLANs for implementing multiple SSIDs to further help segment users on the network. 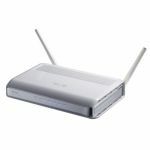 It also includes a wireless client isolation mechanism, which limits direct client-to-client communication. To maximize total return on investment, the DAP-2553 can be configured to optimize network performance based on any one of its multiple operation modes: Access Point, Wireless Distribution System (WDS) with Access Point, WDS/Bridge (No AP Broadcasting) and Wireless Client. With WDS support, network administrators can set up multiple DAP-2553s throughout a facility and configure them to bridge with one another while also providing network access to individual clients. Also included are advanced features such as Load Balancing, which optimizes high network traffic volume, and redundancy for fail-safe wireless connectivity. Additionally, the DAP-2553 offers Spanning Tree Protocol support for greater efficiency and to avoid broadcast storms when used in WDS mode. Network administrators have multiple options for managing the DAP-2553 including Web (HTTP), Secure Sockets Later (SSL, which provides for a secure connection to the Internet), Secure Shell (SSH, which provides for a secure channel between local and remote computers), and Telnet (bi-directional, eight-bit byte oriented communications facility). For advanced network management, administrators can use the D-Link AP Manager II or D-View SNMPv3 management module to configure and manage multiple access points from a single location. In addition to a streamlined management process, the AP Manager II or D-View software provides network administrators with the means of verifying and conducting regular maintenance checks remotely, eliminating the need to send personnel out to physically verify proper operation. With the selectable dual band functionality, PoE support, extensive manageability, versatile operation modes, and solid security enhancements, the new D-Link AirPremier N Dual Band PoE Access Point (DAP-2553) provides SMB environments with a business-class solution for deploying a wireless network in the workplace. * Maximum wireless signal rate derived from IEEE Standard 802.11g, 802.11a, and draft 802.11n specifications. Actual data throughput will vary. Network conditions and environmental factors, including volume of network traffic, building materials and construction, and network overhead, lower actual data throughput rate. Environmental factors will adversely affect wireless signal range.